"I like the one design concept, especially at this level," says Goransson. "I know most of the people here from the other classes that I sail in. Racing the Melges 32 and the RC44 are the hardest things I've ever done in my life, but I enjoy it immensely. It is so cool to be able to race with all these incredible sailors." But surprisingly his local knowledge won't help Team Aqua as this will be the first occasion Goransson has raced here. "It's not that I have anything against Marstrand - it's just never happened," he admits. "I've got lots of friends here, so it seems like it is going to be a very social week for me. I'm hoping to get my nine year old son on the boat today for a ride with us." Having helmed Team Aqua in Malta at the start of the season, Goransson takes the wheel back at a key time for Team Aqua. After the last regatta in Porto Cervo in June, Chris Bake's team regained the fleet racing championship lead and with it the coveted leader's Golden Wheels. Vladimir Prosikhin recounted: "Yesterday was too windy! We broached and stayed on our side for a few minutes, in fact the longest I have experienced." However Prosikhin is a big fan of Marstrand. "I'm very attached to this kind of nature. I've done a lot of cruising around here before. I like Marstrand, it is very nice." For the RC44 Marstrand Cup, Prosikhin has a new tactician with American Bill Hardesty, standing in for America's Cup helmsman Dean Barker. Hardesty is a two time World Champion helmsman in the Etchells keelboat and won the Match Racing World Championship as tactician for Ian Williams. Similarly on board Alexander Novoselov's Katusha, standing in for tactician Andy Horton (on paternity leave this week), will be Luna Rossa's 34th America's Cup helmsman Chris Draper. 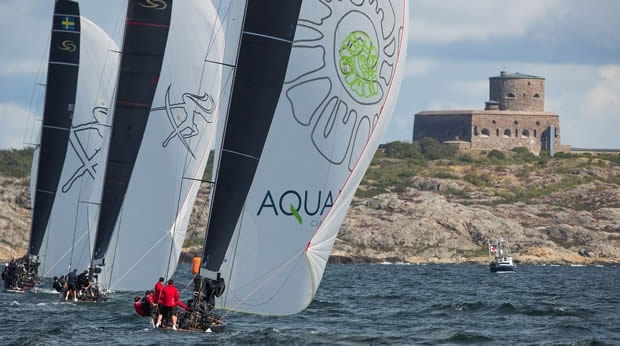 As usual, the RC44 Marstrand Cup kicks off with a day of match racing. The match racing championship, which is on-going from event to event, has Bronenosec Sailing Team leading after two regattas. But just one point behind Vladimir Liubomirov's team are Artemis Racing and John Bassadone's Peninsula Petroleum. Peninsula Petroleum's tactician Vasco Vascotto observed: "For us it is important to show we have improved since Malta. In Porto Cervo we showed our real potential. We know this event will be very tough, but we are ready for a fight." The charismatic Italian is also a fan of the Swedish RC44 venue: "The passion of the people here is great. It is very nice to come here. Sometimes the weather conditions are a little cold, but it is beautiful and when the sun comes out it is very nice."